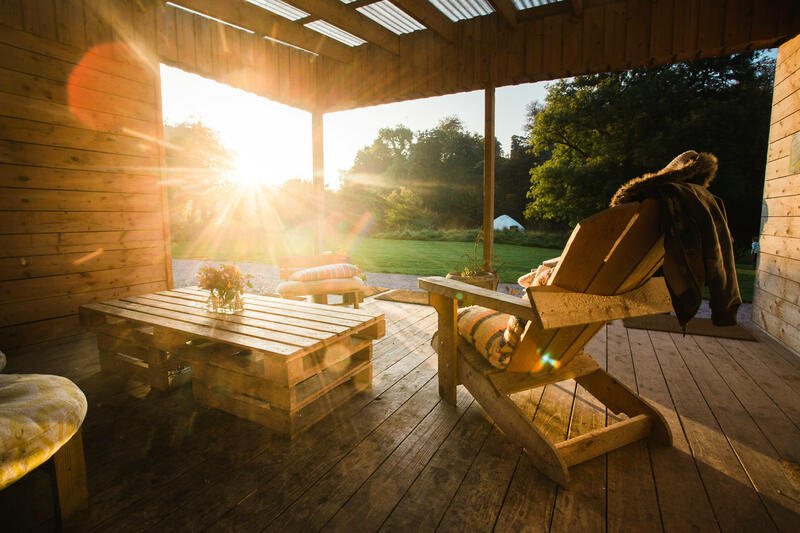 Rock Farm Slane is many things - glamping site, eco lodge, activity centre, and an organic farm. Combined, these equal a unique eco-retreat in Ireland’s Boyne Valley. As part of the Slane Castle estate in County Meath, lush meadows and fields of barley surround the farm. As soon as I turned the corner of the long track that leads to the farm, I knew I was somewhere special. With expansive views of the Hill of Slane to my right and pheasants wandering through the fields to my left, Rock Farm Slane immediately felt like an escape. The farm is a great base for exploring the Boyne Valley – one of the most historic regions of Ireland. 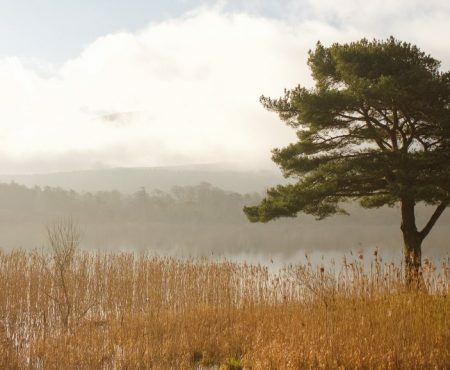 It’s an area that’s steeped in myths and legends and you don’t need to travel far to get a glimpse of Ireland’s Ancient East. The Hill of Slane, north of Slane Village, is visible from the farm. The Battle of the Boyne site is just a short drive away, and the ancient passage tombs at Newgrange and Loughcrew are definitely worth visiting. During glamping season, a quiet hillside on the farm is transformed into a gold-certified eco tourism campsite. 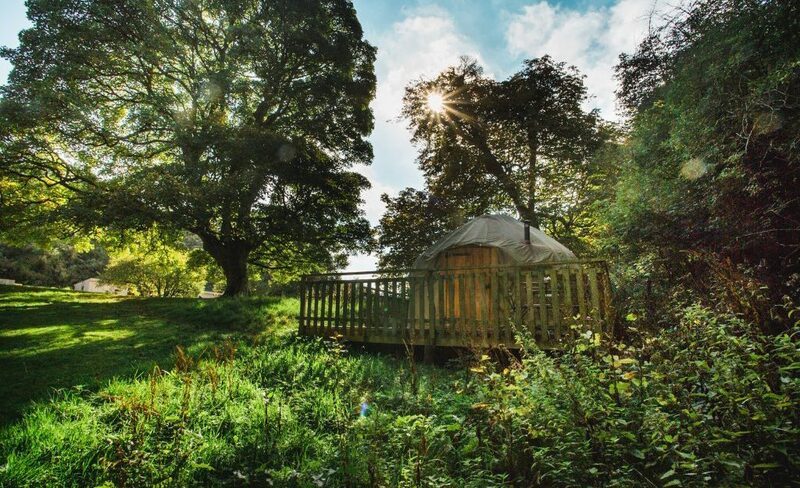 Five luxury yurts sit in a grove of ancient trees, so guests have plenty of privacy. Tentologists (yes, that’s what they’re called) from LPH Bohemia construct the yurts every year. 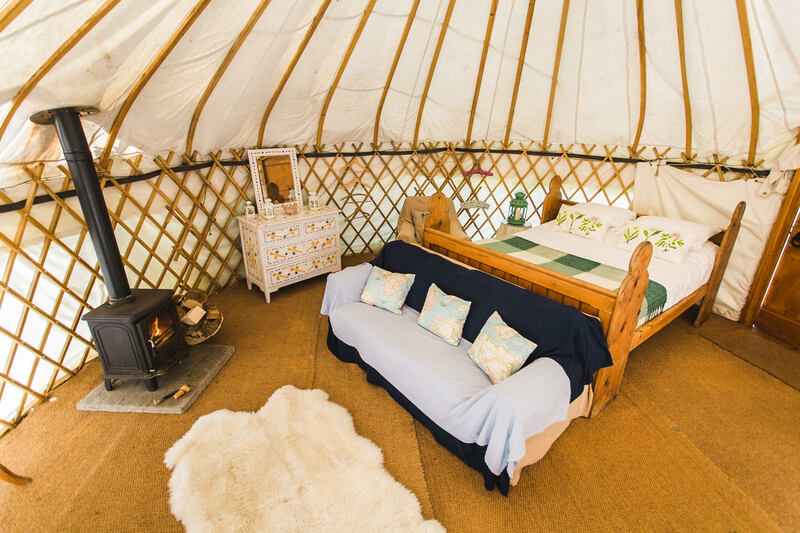 These yurts are wooden frames covered by thick, waterproof canvas. Once inside, you can expect comfortable bedding and cosy furnishings. 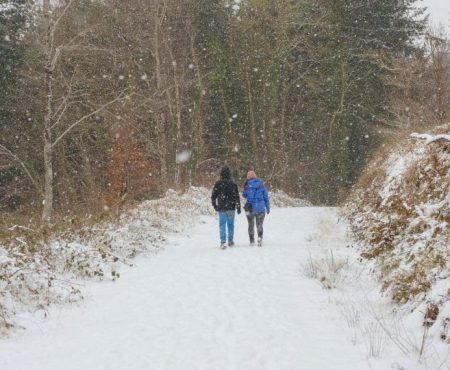 Although the glamping site is only a short walk from the main buildings, it feels secluded. The site overlooks meadows, woodland, and a Natural Heritage Area and Special Area of Conservation. On a clear night, make sure you look up at the sky. The stars twinkle with incredible intensity over the Boyne Valley. 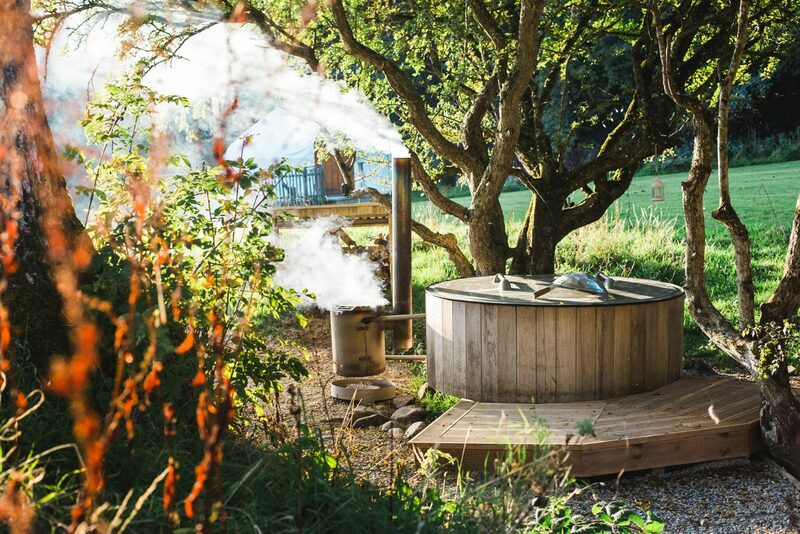 If you happen to be star-gazing from the farm’s hot tub, then even better. There are also two shepherd’s huts at Rock Farm Slane, which sleep up to two people. As glamping was over for the season, I stayed in one of them. These are small, cosy caravans in the style of genuine old shepherd’s huts, so there are no frills. But the beds are big and comfy and each hut has a little wood-burning stove. I visited on an icy November night and I stayed snug all night. Guests have full use of the self-catering facilities on the campsite. A communal building, known as ‘Le Shack’, is where you’ll find the kitchen and dining area, as well as toilets and showers. You can also order a breakfast pack of farm-fresh eggs, sausages, and bacon. As I’m vegetarian, my breakfast pack was meat-free, so let the staff know if you have special dietary requirements. Lime House, the farm’s self-catering eco lodge, has been open since 2015. This house is gorgeous – think huge windows, sunlight, plants, and lots of wood. The living area has a wood-burning stove, which is perfect for getting cosy on a winter evening. There’s also a spacious dining area and the kitchen has everything you’d ever need to cook something delicious. 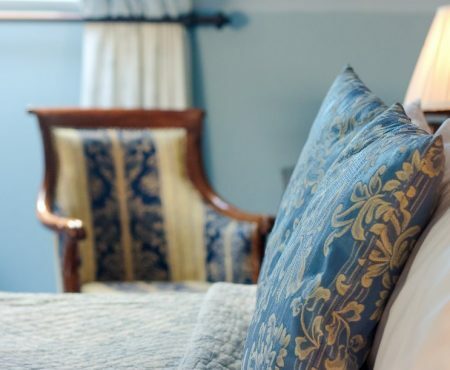 Upstairs, there are six large bedrooms, four of which are en-suite, and the lodge can sleep up to 22 guests. Lime House has been booked for yoga retreats, wedding parties, and birthdays, and it’s available for group bookings throughout the year. What makes Lime House really special is that it’s a great example of what can be done using environmentally friendly building methods. 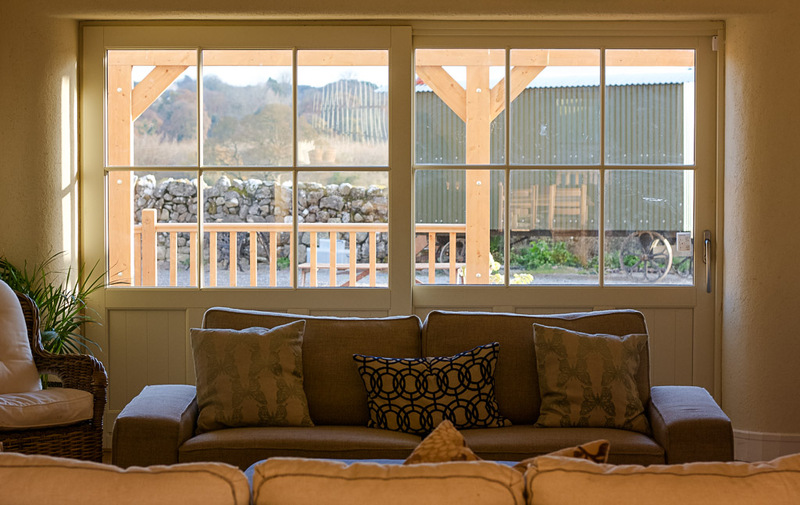 As part of Rock Farm Slane’s eco-build project, they constructed the lodge using straw bales. If you want to learn more about straw bale building, the team is very knowledgeable. As if the glamping and eco lodge weren’t enough, Rock Farm Slane is also a working organic farm. If you go for a stroll, you’ll see pigs, cows, ponies, chickens, and the sweetest little pet calf. The on site farm shop sells some organic produce, as well as free range turkeys, hams, and eggs. The farm is also hosting mini food festivals, as part of the Boyne Valley Food Series, in 2017. 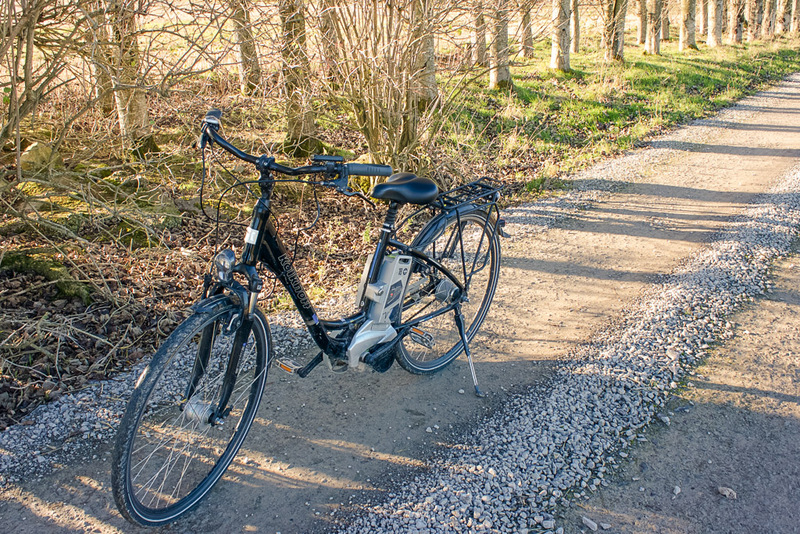 The farm has eight Kalkhoff electric bikes to hire for guided or self-guided tours. The bikes power you along at a surprising speed, so you can explore more of the countryside in less time. You can either take some maps and go exploring by yourself or join a group tour. The Slane Food Circle Tour (25km) is a guided bike tour, which includes stops at Shalvanstown organic farm and Mullagha Farm (Boyne Valley Blue Cheese). You’ll have the chance to pick up lunch as you go, as a picnic stop is included in the tour. I hadn’t heard of recreational tree climbing until I arrived at Rock Farm Slane. Turns out, it’s a fun and challenging way to get up into the tree canopy. Experienced instructors will teach you how to climb using ropes, and you’ll also have a harness and a helmet. There are tree top hammocks to relax in once you make it to the top. The farm is situated next to the River Boyne and if you feel like getting out on the water, there are local kayaking and rafting guides who can take you out. 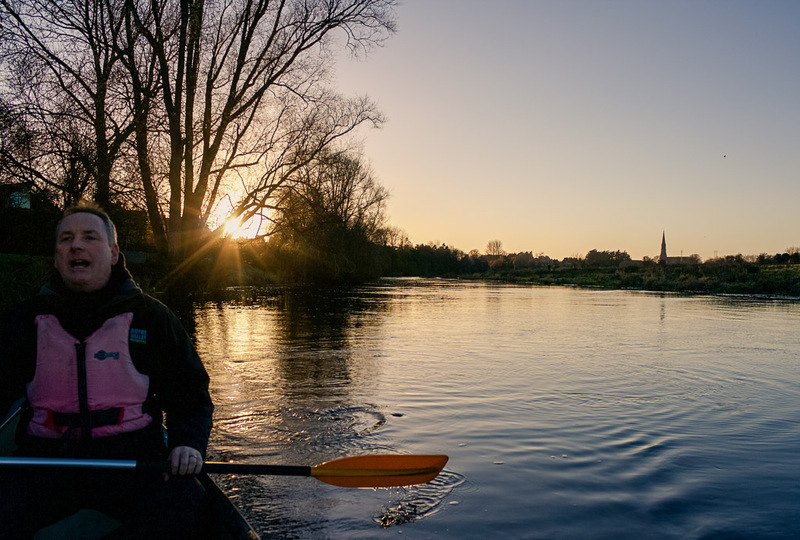 For a more historic slant on watersports, James from Boyne Valley Activities offers ‘Floating Through Time’ tours along the Boyne. Planning a trip to Rock Farm Slane? The farm is a 50-minute drive from Dublin City Centre and around a 40-minute drive from Dublin Airport. The glamping season runs from April-November and the site can also be hired for private events. Many thanks to Discover Boyne Valley and Rock Farm Slane for hosting my trip. As always, all opinions are my own.